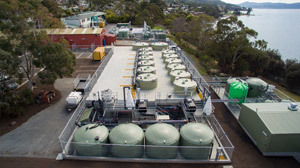 In partnership with Huon Aquaculture, Skretting, the University of Tasmania's Institute for Marine and Antarctic Studies, and the Tasmanian and Australian Governments, the Experimental Aquaculture Facility (EAF) was opened in October, 2015. Located at IMAS's Taroona fisheries and aquaculture research centre, the EAF is the first of its kind in the Southern Hemisphere. It features recirculation aquaculture systems, 12 tanks of 7000 litres, 12 tanks of 2500 litres and two stock tanks of 13 000 litres. A modern Experimental Aquaculture Facility (EAF) for directed, commercially-relevant research, is fundamental to ensure the economic and environmental sustainability of these important industries for Tasmania, Australia and internationally – now and into the future. The primary purpose of the EAF is to provide specialist research facilities to support the growth and sustainability of the salmonid industry. The EAF is seen as a key plank in Industry’s strategic future, providing a research capability that will underpin growth, sustainability and the ability to adapt to a changing environment of increasing sea water temperatures. 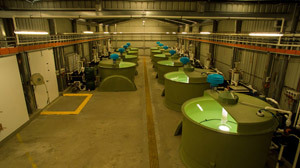 Although the University has been able to provide research through existing facilities, a dedicated facility and increased tank capacity is required where the environmental characteristics can be controlled (e.g. temperature), and research can be done on larger fish (e.g. nutrition). Maintaining size of fish during extreme high temperatures. Peter and Frances Bender of Huon Aquaculture saw continuing research and development as an essential tool for achieving their aims, and set out to employ the world’s top people in their field to assist them. The company continues to lead the industry in R&D initiatives, turning research into practical innovations.